stage. Problems were solved by the use of words and prose. During the 3rd century, Diophantus of Alexandria (ca. 250) wrote the book Arithmetica. several practical problems and avoided any general procedures. Brahmagupta presented the general solution to quadratic equations. word “al-jabr”, that means completion, is the origins of the modern word “algebra”. The 12th century witnessed the Persian mathematician, Omar Khayyam (ca. 1044 – ca. algebra. Algebra entered its last stage of development at this time; the symbolic stage. (1593 - 1632) in 1629.
exists exactly n solutions to the equation. Descartes (1596 - 1650). It took some time for it to be fully accepted. the rectangular coordinate system being named after him (the “Cartesian Plane”). Geometric concepts are now described by equations and symbolic expressions. aspect to it. Algebra has been described as the language of science. “dynamic and a necessary vehicle for describing a changing world”. the text were more like a recipe than anything else. their common sign to the result. students to go on to college and study mathematics, science, and engineering. and analytic geometry were introduced. applicable to and “reachable” by all students. These concepts are inherent in most modern day middle/high school algebra textbooks. is occurring at all levels. standards forces one to rethink the way in which algebra is learned as well as taught. causes and think about “thinking mathematically”. grounded in previously learned less abstract concepts. set of values, rather than a constant. authors tell us the importance of problem solving and equations. Matrices and game theory, as well as other areas, are included in the study of algebra. Algebra is no longer seen as a collection of rules and methods of doing mathematics. So what is the definition of algebra? The NCTM recommends that all five content strands be distributed over all grade levels. proportionality as an integrative theme in the middle-grades mathematics program. students will benefit from a rich and integrated treatment of mathematics content. educationally unwise and mathematically counterproductive. • analyze how both repeating and growing patterns are generated. • represent and analyze patterns and functions, using words, tables, and graphs. to represent and examine functions and patterns of change. • interpret representations of functions of two variables . invented and conventional symbolic notations. • express mathematical relationships using equations. that letters can be used to stand for unknown numbers in equations. manipulations, including those carried out by technology. square meters to square feet. solutions for equations, a goal that has always been at the heart of the algebra curriculum. in the form f(x) = (x – 3)(x + 1) and thus identify its roots as x = 3 and x = –1. and equations to draw conclusions. • draw reasonable conclusions about a situation being modeled. • describe quantitative change, such as a student's growing two inches in one year. • use graphs to analyze the nature of changes in quantities in linear relationships. • approximate and interpret rates of change from graphical and numerical data. curriculum requirements for the state K-12 schools in Rule 10, Section 4.
opportunities for students to develop understanding of the structure of mathematics. 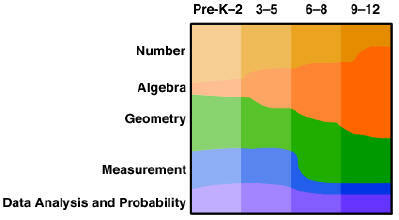 The Algebraic Concepts category contains three or four standards per benchmark grade. Refer to the copy of the NMS provided. curriculum for the most part follows that described by Dolciani in her popular textbooks. of exercises and an emphasis on symbolic manipulation. Refer to the sample unit provided. these categories at a time. Algebra of course is a common thread throughout all lessons.